A reasonably entertaining miniseries...made with obvious attention to (if not always success in) pleasing genre fans. 450 min. BBC. Director: Guy Ferland. Cast: Mekhi Phifer, Wayne Knight, Bill Pullman, Lauren Ambrose, Frances Fisher, C. Thomas Howell. Torchwood: Miracle Day—a.k.a. the fourth series of Torchwood—came on with excitable hype then was met with a disappointed sigh from most critics and fans. It's true that Torchwood: Miracle Day doesn't live up to the standard set by its immediate predecessor, Torchwood: Children of Earth, but it's a reasonably entertaining miniseries all the same, one made with obvious attention to (if not always success in) pleasing genre fans. The dissassembled Torchwood—mysterious and proudly bisexual hero Captain Jack Harkness (John Barrowman) and fierce but maternal Welshwoman Gwen Cooper (Eve Myles)—reassembles to solve a new mystery, recruiting from the CIA two new members along the way: hotheaded field agent Rex Matheson (Mekhi Pfifer of Lie to Me) and analyst Esther Drummond (Alexa Havins). Echoing Children of Earth, Miracle Day concerns a head-spinning global crisis: this time, death takes a holiday. With no one on Earth dying, the consequences of immortality quickly begin to pile up: a shortage of basic resources, an emergency need to overhaul the health care system, and worse—much worse. When the previously immortal Jack discovers he can now be injured or killed, the mystery deepens: who or what has caused this global shift, and what does Jack have to do with it? Since Miracle Day was co-produced by the BBC and American cable network Starz, the budget gets a bump, which Davies gleefully exploits with rocket launchers, helicopters, and exploding buildings. But the best of the miniseries is its pure science-fiction approach to a "what if?" scenario, used as a springboard for allegory about the best and worst of human nature. Those who should have died but haven't become second-class citizens in increasingly sinister ways, and exploitation by a drug corporation proves to be only the surface of a deeper conspiracy. That the conspiracy doesn't convincingly cohere is one of Miracle Day's bigger problems: at ten episodes, the narrative variously seems stretched out or, conversely, inadequate to detail the backstory of the bad guys. The new team members aren't as endearing as the ones they replace, but they grew on me, and they certainly provide new and contrasting dynamics for the writers to explore. Starz hasn't re-upped Torchwood, but hopefully it will return some day, in some form. 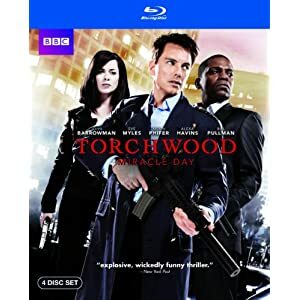 Courtesy of the BBC, Torchwood: Miracle Day comes to Blu-ray in a four-disc set featuring 1080i hi-def picture and DTS-HD HR 5.1 sound. The picture quality is terrific, with especially bold color and plenty of detail and texture. Aside from some native artifacting in visual effects shots, the image is clean and handsome, with deep black level and pleasing contrast. The lossy DTS-HD High Resolution 5.1 surround mix gets the job done nicely, with punch-packing effects, clear dialogue and substantial ambient immersion. While the set includes many enjoyable bonus features, pretty much all of them are laden in spoilers, so skip all of the lame episode introductions (with a quick trigger finger on your remote) by head writer/executive producer Russell T. Davies and John Barrowman, and wait until viewing the series before proceeding to any of the bonus material. We get audio commentaries from executive producer Julie Gardner and Davies on the first and last episodes of the season, "The New World" and "The Blood Line." Torchwood fans already know what to expect from these gabby old friends: they're always engaging, informative and witty. Actually, the Character Profiles (9:55, HD) are, I think, safe to watch before ejecting Disc One; they include Captain Jack Harkness, Gwen Cooper, Rex Matheson, Oswald Danes, and Rhys Williams. Disc Two serves up an "FX Special" (16:00, HD), while Disc Three gets meaty with a "Behind the Scenes" that's the latest installment of parallel BBC series Torchwood: Declassified. (30:00, HD), which presents plenty of juicy set footage and extensive cast and crew interviews. A few "Deleted Scenes" (8:00, HD) on Disc Four are mostly interesting for the raw footage before, after, or in between takes. The "Torchwood Motion Comic" (30:00, HD)—a.k.a. Torchwood: Web of Lies is a nifty bonus (originally a web series) with some clever writing by Jane Espenson and Ryan Scott, and the vocal participation of Barrowman, Eve Myles and Eliza Dushku. All site content © 2000-2019 Peter Canavese. Page generated at 04/17/2019 08:39:42PM.